The functionality of codeBeamer ALM’s DevOps feature set spans the entire lifecycle to help you align teams and stakeholders, enhance collaboration, automate your CI&CD pipeline, and integrate customer feedback across the process of development. For safety-critical developers, it offers end-to-end traceability and an automatically recorded audit trail to bridge the gap between DevOps and auditors or compliance officers. codeBeamer’s DevOps ALM features are organically integrated into the platform’s powerful Application Lifecycle Management functionality. Its DevOps feature set lets you optimize both effectiveness (“doing the right thing”) and efficiency (“doing the thing right”) across the DevOps value stream. codeBeamer ALM is the first Development+Operations platform specifically built for safety-critical industries with enterprise-grade compliance support to reduce the time and costs of audits. With a full set of Agile, Dev, and Ops features relying on a single central repository, codeBeamer ALM lets you replace a fragmented chain of single-point tools with a central, holistically integrated DevOps platform. It offers complete traceability and auditability for safety-critical industries (medical, automotive, avionics, pharma), and powerful features along the lifecycle. codeBeamer ALM automatically records a fully documented audit trail with e-signatures, and effectively bridges the gap between DevOps and auditors to accelerate and cut the costs of compliance. The platform has built-in features for Agile Planning, Continuous Integration & Delivery, build, testing, deployment, and monitoring. It also offers integrations with 50+ third party software tools to ensure traceability across the DevOps lifecycle. Its Review Hub and Audit Trail Report features ensure efficient and fully controlled review processes and smooth compliance audits. With a common backlog for all types of artifacts, codeBeamer’s DevOps feature set enables Value Stream optimization for user stories, bugs, requirements, tests, and all kinds of artifacts. 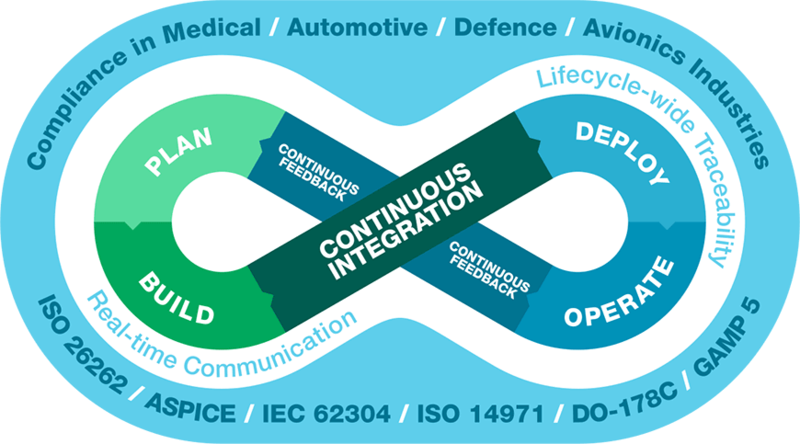 codeBeamer ALM’s DevOps tool is a unique solution for companies that want to align Agile development and Ops processes, achieve faster delivery fulfilling all customers requirements, complete risk management, and compliance with ISO/IEC/FDA/etc standard requirements all at the same time. codeBeamer ALM’s DevOps functionality offers Agile Sprint and Release Planning capabilities to help you map and manage your sprints and releases. Record approved requirements and channel feedback into a global backlog, and prioritize requirements, tasks, bugs, etc using the Planner. Using this global backlog enables you to optimize your entire business value stream all in one place. By enabling you to channel all types of artifacts into a single product backlog and prioritize those items efficiently, codeBeamer ALM helps you focus on the activities that deliver the most value. With a shared Kanban board, you can make Ops tasks visible for all stakeholders. Use custom review & approval workflows, let your team members vote on artifacts, and use the Review Hub to gather feedback about all kind of artifacts. Like the code review process that is so commonly used in software development, the general review process offered by codeBeamer ALM is a highly effective way of enhancing quality while providing complete transparency. Take advantage of ChatOps to put your conversations to work. Integrations with Slack and Mattermost enable you to take collaboration to the next level. Use chatbots with Artificial Intelligence support, cross-platform commands, and more. Track, manage, act, and decide from any location, any time. Use codeBeamer ALM’s complete software development and DevOps functionality with fully traceable work items and custom processes. codeBeamer is integrated with Git (GitLab, GitHub with pull requests), Subversion, Mercurial, Plastic SCM, and Perforce VCS for source code management and version control. Automate the build process funnelling into your CI pipeline using Jenkins. Use a staging environment to test code before deployment. Automate Continuous Integration & Continuous Delivery processes, accelerate cycle times, and reduce failure rates and downtime. Fix problems early and often, minimize costs, and improve product quality. codeBeamer ALM lets you manage all your manual and automated testing activites all in one place. With parametrized testing and integrations with automated testing tools (Jenkins, JUnit, JMeter, Selenium), codeBeamer’s DevOps features help streamline your CI pipeline. The system also supports test analysis and lets you set up insightful dashboard and reports for monitoring and feedback. Manage your CD pipeline from an all-in-one central DevOps hub. Use codeBeamer’s Agile Release Planner to keep releases organized in a single release for small teams, or in overarching Agile Release Trains to accelerate the delivery cycle for large Agile teams. Generate and manage containers for deployment using integrations with Docker and Kubernetes. Automate deployment via Jenkins. Keep track of, analyze, and report on all monitoring data with visual reports in codeBeamer ALM. Integrate any tool via Slack to monitor the performance and stability of your application and infrastructure. Receive e-mail or Slack notifications right when and where you need them, enabling your team to swarm on issues in a timely manner. Manage escalations with automated workflows, and enhance visibility with a filterable Kanban board to stay on top of Ops processes. Create custom reports with visual graphs to uncover bottlenecks. Incorporate customer feedback in the process of development by configuring a fully customizable Service Desk for your users. By creating executable work items, the Service Desk channels user feedback right into the process of development, all in a traceable manner. Stay on top of incident management and problem tracking using codeBeamer’s built-in project and quality monitoring features. Integrate feedback submitted via e-mail, customize notification rules, and configure custom integrations via REST API. 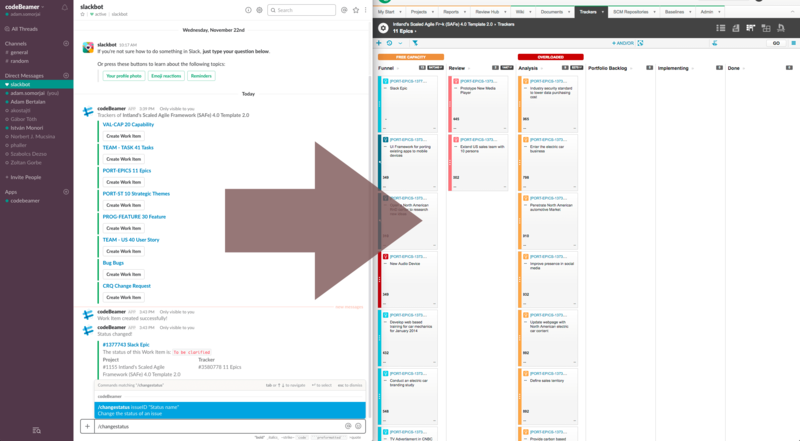 Give your developers, managers, and operations team a single view of the entire DevOps value stream even across projects. Monitor progress and collaborate in one shared platform. Build, share, and export custom reports and visual dashboards.